My stepdaughters’ school has decided to introduce a nice, smart new uniform – which has got my goat because staff persistently told parents it would only be for students starting the school in/after September 2014 and now it will be for all pupils, new and existing. Anticipating the backlash over the expense, the school has managed to persuade the organisation which runs the Academy it is part of to cover the cost of blazers and ties – but not shirts. I spent almost £35 per child on shirts when they started the school and bought sizes aimed at making sure they’d last the whole four years – because the school insisted on branded shirts with the school logo on rather than the inexpensive kind I could buy in a three pack at the supermarket. So I’m not best pleased at £70 down the drain and having to dig in my pocket for more new shirts. I also think that if a school can find a big chunk of money seemingly out of thin air then that money should be spent on educating my girls rather than clothing them in this new, but at the end of the day not vital, uniform. New uniform: for girls this will consist of a smile, a small waist and long legs. 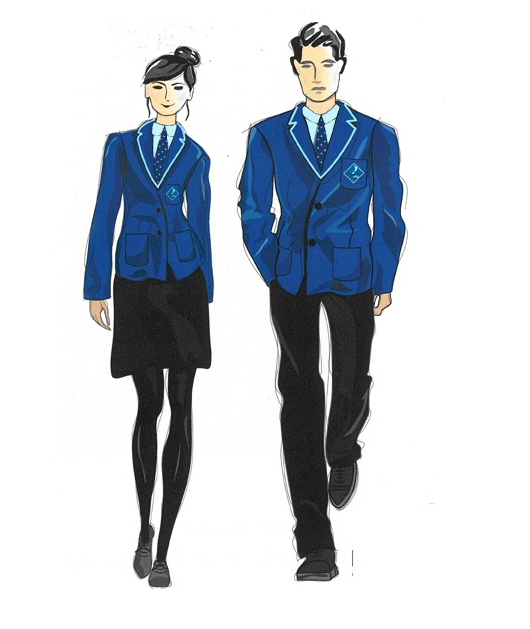 As if all that weren’t irksome enough I decided to have a look at the school’s website to see if they had posted an image of the new uniform. They had. I must admit I think it looks very smart but then I looked closer and it struck me just how long-legged and thin the girl looks and yet also curvy – and how she is also smiling while her male counterpart looks very straight-faced. This bothered me. Whether intentional or not it seems to be sending a message to female students about femininity. Firstly – the girl is in a skirt. There is no corresponding image of a girl in trousers. Then there’s the body shape – like a mannequin – all (subjectively) idealised proportions. Finally the smile – because girls and women are expected to always return smiles and look happy and cheerful at all times. Or else face those exasperating, “Cheer up. It might never happen,” comments. Maybe I’m an ‘old’ feminist over-reacting (no, I don’t really believe that either) but these seemingly innocent little sketches are just the kind of image that littered the magazines I read as a kid and made me feel bad about my puppy fat and as if I wasn’t a normal girl – so I think the school, especially in these more impact-of-body-image-on-children aware times and after months of apparent consultation on the new uniform, should have spent a little longer making sure the sketch portrayed a more average-looking students. Instead, not only do the little darlings have to cope with going from a fairly casual polo shirt type uniform into something that (certainly around here) makes them look more like a buttoned-up public school kid, but they also have to feel bad about not having a tiny waist, giraffe-like legs and a perpetually smiley fizzog. It’s time schools woke up to the effect that gender stereotyping has. Not just on the girls who are bashed with it but on society as a whole and the lot of all girls and women well into in the future.